Well, our area was recently hammered by a major snow storm with accumulation totaling over 6 feet in some areas! Thankfully, our town wasn't part of that storm but I kind of wished we were. I love snow, but sometimes too much is not good. My kids would have had fun though. :) When we get major snow storms around here, we sometimes lose power and when that happens, I break out the candles and flashlights. Unfortunately for us, my children often get ahold of our flashlights and they mysteriously disappear or have totally dead batteries when we need them. I have made it my mission to hide any and all flashlights so when we have a power outage, we can still have light. Dorcy is a company that carries all different kinds of flashlights, as well as spotlights, lanterns and other lighting devices. Flashlights are items that anyone can use and they can be used in many different ways. If anyone knows flashlights, it's Dorcy. Here is a bit more about this company. Privately held company, headquartered in Columbus, OH. 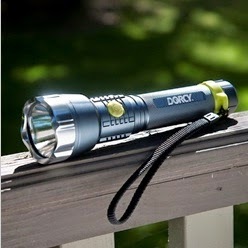 DORCY have marketed Flashlight products for over 55 years. DORCY is proud to be business partners with many of the world’s largest retailers. Sears Wal-Mart ACE Hardware TruServ Target DORCY is the only Flashlight manufacturer to have true factory ownership and a fully staffed Hong Kong office. Complete packaging and distribution center in Columbus, Ohio. Dorcy’s Competitive Advantages Include: Widest range of Lighting Products available from any competitor Evolving with the Market demands – LED, Fashion Trends, etc. Leadership in New Product development initiatives. Complete complimentary Flashlight and Battery Program DORCY has the strongest Value Pack Promotions in the industry Excellent consumer value, and retail margin contribution. Creative, flexible pack assortments. I was excited about the opportunity to get to know this company better and test out their products as well. My only flashlight in the house has died recently and now, I have none. Booo. So, this was the other reason I was excited about Dorcy Flashlights. So, for this review I was sent the Metal Gear XL-M Extreme 618 Lumen LED Flashlight, which retails for $79.99. Upon opening the box, I found a very typical looking flashlight. The outer shell is made out of durable Aerospace Grade Anodized Aluminum, and honestly, makes this flashlight look big and bad. Weight wise, it is not a heavy flashlight at all. I was surprised that it was very average feeling as far as the weight goes. So, what makes this flashlight so special? If you look into the flashlight, you will not see a traditional light bulb. This flashlight features a single LED chip that produces 618 lumens of light. WOW. That means one thing to me...it is BRIGHT. The beam distance of this flashlight is 363 meters or 1100 feet. I turned all the lights off in my kitchen and hallway to see how bright this light would shine and I was amazed. You have a choice between two different settings, one is dim and the other is bright. I would have to say that the dim setting looks pretty typical of a normal flashlight. The bright setting is super bright. We used this flashlight in our basement today to replace some overhead fluorescent light bulbs and it was very nice to have such a bright light. This flashlight has come in handy around my house already and I am thrilled to finally have a bright, reliable flashlight for when the power goes out. So, for all of your lighting needs, be sure to check out Dorcy! They carry security lighting as well, which is really nice to have. Visit Dorcy on Facebook and also check out their Twitter page...I am sure they would love to have you stop by! Disclaimer: I received no monetary compensation for this post. I did receive free Dorcy Products for review purposes. All quotes and stock photos are from the Dorcy website and email. My photos are my own and may not be used without my permission. All thoughts and opinions are 100% mine.